Molly Malone’s | David Baron Music | The Official Site of Singer/Songwriter David Baron. 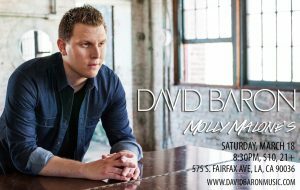 On Saturday, March 18, singer-songwriter David Baron will take the stage for a full-band show at Molly Malone’s in Los Angeles. The show will feature performances of songs from Baron’s latest full-length album of all original material, Heartbeat, as well as old favorites. The concert begins at 8:30pm, and tickets are $10 at the door for ages 21 and over. For more information, visit http://mollymalonesla.com/.